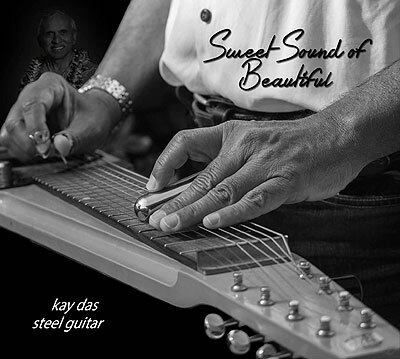 Renowned for his impeccable musicianship on the 8 string Steel-O-Caster guitar, Kay Das keeps the spirit of great guitar music strong on his 21 track 2015 CD Sweet Sound Of Beautiful. Kay has always been a huge fan of the Abbey Road guitar sound and by that I mean, Kays endless fascination with the guitar sounds and songs of The Shadows and The Beatles - the two best bands to record at the fabled London recording studios. 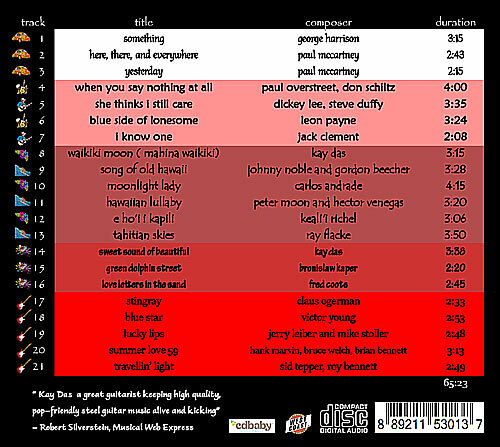 True to form, Kay starts Sweet Sound Of Beautiful off the 21 track CD with a trio of Beatles covers. From there, he puts his instrumental guitar stamp on a range of choice quality tracks from the realm of country & western and Hawaiian music favorites before closing the CD with five tracks associated with the sounds of Hank Marvin & The Shadows, with some dating back to the early 1960s and early 1980s too. A number of tracks here features Kays steel guitar with backing from a range percussionists and accompanists, including Kays son David Das, who also handles the album mastering. Guitar fans who enjoy George Harrisons tasty slide work and Hank Marvins endless fascination with studio echo will find much to like here. Its fascinating to hear how Kay ties up all the loose ends of guitar lore. Some rock fans might have started with Hank but from there, the guitar-centric among us naturally morphed into Beatles style song writing as well as rock n roll, country & western and the more pure sonic tones of Hawaiian steel guitar. 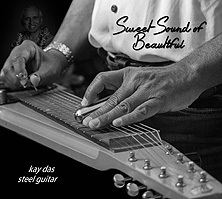 Everything cool and sonically savory about steel guitar pop instrumentals can be found, heard and appreciated on Sweet Sound Of Beautiful by guitar master Kay Das. mwe3: What was your approach to choosing the music and recording Sweet Sound Of Beautiful this time? Seems like youve hit a cool groove between blending The Beatles, The Shadows, C&W music and of course Hawaiian music. Is that the trademark Kay Das guitar sound? Also what guitars are you playing on the new album? Kay Das: Robert, thanks again for getting in touch. During the previous interview for my last album, Hawaiian Shadows, you kept badgering me with many soul-searching questions that I found a joy to answer. Thank you for the questions again. They deepened my sensitivities for the music I had been recording. As I would have mentioned before, I am trying to get the steel guitar back onto a world platform by, tastefully creating instrumentals from a variety of genres. 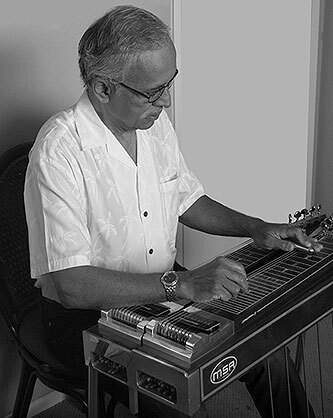 My inspiration comes from a variety of sources, a recent one being a recording by an early Hawaiian steel guitar master Sol Ho'opi'i - who played Gershwin, including  Fascinating Rhythm on a steel guitar. Absolute magic! Proved that the steel guitar could sound good on non-Hawaiian genres. The main guitar I play on this album, a Steelocaster, is custom made by Bob Littleton of West Coast Steel in Washington state. I also play some of his standard Hawaiian designs and also a converted Charvel Jackson electro-acoustic. Due to my childhood influences from The Shadows, I had always wondered what a Stratocaster-like steel guitar would sound like. Bob built one to my specification, did a wonderful job. mwe3: You begin Sweet Sound Of Beautiful with the three Beatles covers. Something, one of the greatest Beatles songs of course is just made for guitar. How did you approach the song to make it different from other versions, say including Hank Marvins 1970 version with The Shadows?  is a flip in the outro chord sequence from F  Eb  G  A/ F  Eb  G  C to F  Eb  G  C/ F  Eb  G  A, more tantalizing as an ending, I think. mwe3: Sweet Sound Of Beautiful goes from the Beatles music into country & western music. Being a steel guitarist you must also be a big C&W music fan too. Do you use any different guitar techniques from moving away from the Abbey Road Sound to the country & western sound and how about some inside stories on how you decided on covering these four country music favorites? You can hear a kind of Shadows edge on When You Say Nothing At All. 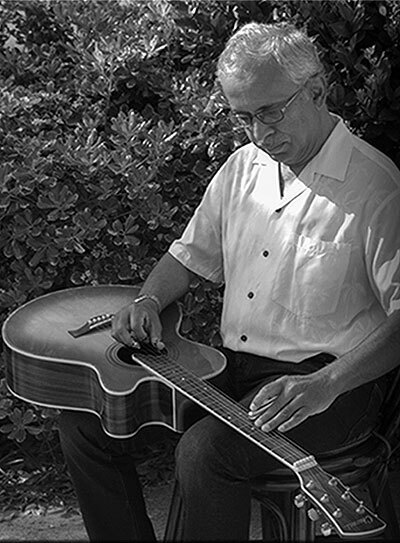 Kay Das: I love the older style of country music, and particularly the crossover genres first introduced in productions by Chet Atkins for singers like Jim Reeves and the late Jim Ed Brown, followed up a few years later by Kris Kristofersson, Sammi Smith, Tammy Wynette and others. Ray Charles was a particular favorite. I think crossover genres in particular have a fascination for me. My favorite male singer was Jim Reeves, in my opinion never equaled even now some forty years after his premature demise. Blue Side of Lonesome and  I Know One are favorites from my early years in India. They followed on the heels of his biggest hit, Hell Have To Go. There were many others. Yes, I deliberately moved away from the lap steel I used for the Abbey Road hits and used a pedal steel guitar for the most part. On the country tracks I chose to begin on lap steel with Ronan Keatings hit with which Hank Marvin made an marvelous instrumental cover of in his album Marvin At The Movies. That would be the edge you may be referring to! mwe3: Is the steel sound the thing that appeals most to you about country music and what are some of your favorite steel flavored C&W guitarists and C & W albums of all time? 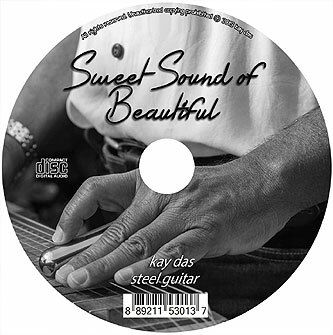 Kay Das: Yes, I have a weakness for steel sounds in a country music album and I confess that before I buy one, I first scan any available literature to find out if there is a steel involved. My favorite C&W guitarist list would, of course, have to start with Chet Atkins. Track 13 later in this album, Tahitian Skies is from Chets album with Mark Knopfler, Neck and Neck, one of my best loved albums of all time. My other pedal steel guitar heroes are Buddy Emmons, the late greats Jeff Newman, Hal Rugg, Weldon Myrick, and Winnie Winston... I was a student of Winnie, and a host of others. Paul Franklin and Greg Leisz, who lives and records close by here, are other contemporaries. mwe3: One of your trademark guitar styles of course is Hawaiian music. Have you been to Hawaii recently? You play six Hawaiian style tracks on Sweet Sound but most impressive is your own composition Waikiki Moon (Mahina Waikiki). With all the covers on your albums, do you feel kind of overlooked as a composer in your own right? How many instrumentals have you written? 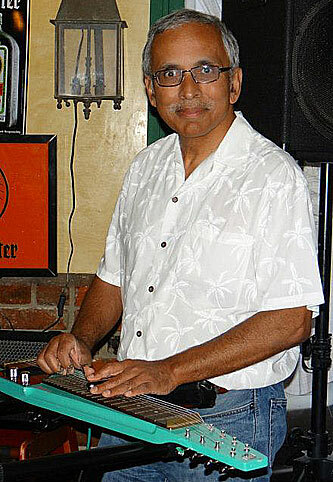 Kay Das: I am amazed by the number of tunes that originate from the small surface area of the Hawaiian islands, and its not only steel guitar music. Yes, I visit Hawaii as often as I can, perhaps once or twice a year and I am known to the steel guitar community in the islands. I enjoy making covers and occasionally wish to add to the music of the world with my own contributions. No, I do not feel overlooked at all. I have written a few originals over the years... Jacaranda, Sunset Over the Kushiara,  Pua Melia, Adriana, Flower of My Heart to name some that can be found on iTunes and other sites. But, the majority of my recordings have been covers. mwe3: Among the other Hawaiian music composers covered on the new CD, the one known in more recent times is Peter Moon. Tell us about the other Hawaiian music composers on Sweet Sound and how you decided on these songs to cover? Any other guitar news from Hawaii these days? 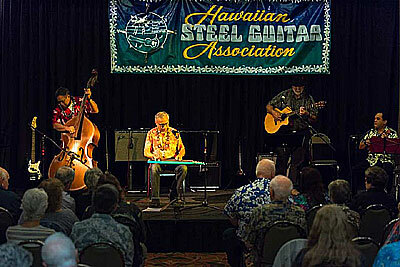 Is the steel guitar still hugely popular in Hawaii as it was in the 1960s? Interesting that both Chet Atkins and Les Paul were big Hawaiian music enthusiasts. Kay Das: Peter Moon is a great musician with many hits to his name, struck by an illness but now recovering, and long may he live. His son carries on in the rich tradition of his father. 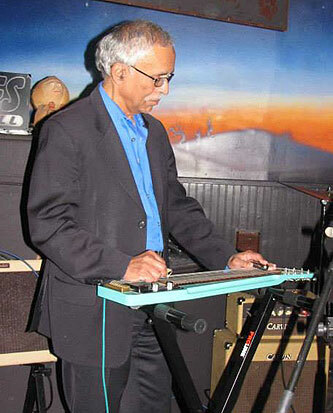 I should like to pay particular tribute to Alan Akaka who got me interested in lap steel guitar again. I had started learning steel guitar from my mother who then gave it up and passed it down to me at ten years old. During my teenage years, the 1960s, I started to learn the regular guitar, which was more hip, particularly the era of The Shadows and The Beatles. Although I never forgot the lap steel, it remained a background interest until I grew curious of the pedal steel and took up learning it with Winnie Winston in the 1980s. On a visit to Hawaii in the early 90s I met Alan who, hearing my story, urged me to take it up again as he said there were not many Hawaiians that could play it in the land of its birth. 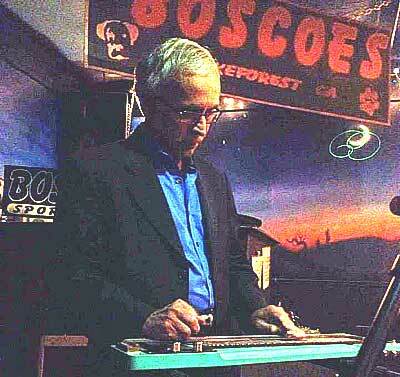 Alan is doing yeoman service to the future of the lap steel guitar, teaching it to his young students in Hawaii. Some of the other forefront performers in Hawaii today in addition to Alan Akaka are: Jeff Au Hoy, Ken Emerson (now mainland-based), Bobby Ingano, Casey Olsen, Greg Sardinha, Wayne Shishido, Paul Kim, Eddie Palama to name a few others. They have their distinctive styles but also carry on the legacies of past masters like Sol Ho'opi'i, Jules Ah See, David Kelii, Gabby Pahinui, Feet Rogers, Barney Isaacs, Jerry Byrd, to name just a few, whose names are revered and styles emulated. One instantiation is Ronald Kanahele who sadly passed away a few years ago but I was fortunate to have met him and observed him play, learnt a trick or two. He came from the Feet Rogers family and I, as a winner of a Hawaii Music Awards special prize a few years ago, had the privilege to nominate him for a posthumous Lifetime Award. mwe3: Also how did you find the song E hoi i Kapili? It sounds like the most Hawaiian sounding song Ive ever heard! Kay Das: E hoi i Kapili, a Hawaiian love song, was written by Keali'i Reichel from the island of Maui. I loved it the first time I heard it, a recording by Nina Kealiwahamana with Jerry Byrd on steel. This recording drew inspiration from that version. 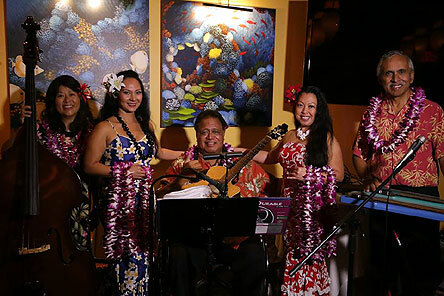 I had occasion to accompany a noted Hawaiian singer, Ed Punua no mean steel guitarist himself, last year on stage. mwe3: Track 14 is the title track to Sweet Sound Of Beautiful and its another Kay Das original. Any inside stories on that track? Can you tell us about the instrumentation of that track and how many guitars are you playing and overdubbing? Kay Das: The inside story to this composition was inspiration from the guitar stylings of Eric Johnson. I figured that a steel guitar should sound good with a warm fuzz sound. It all started with that thought. I had some fun with a Johnson J-station and added some sampled layers from a Roland E-09. mwe3: Track 15 is a great Kay Das cover of the jazz standard Green Dolphin Street. How long have you been playing that track? It is one of the great jazz standards of all time. Does this mean you might get more into playing steel arrangements of jazz classics and/or other movies themes? Also tell us about the movie Green Dolphin Street as its just amazing what you find out when you read the liner notes to a Kay Das CD! I had no idea there was a movie by that name with that song! Kay Das: The musical chord structure of Green Dolphin Street caught my ear and I had not been playing it for very long. I would love to do more jazz classics. This tune is melodically slow moving with many sustained notes with harmonies that rarely change more frequently than once per measure and this affords the instrumentalist good opportunity to improvise. The musical structure is fairly typical of compositions during and just after WW II and I think a good fit for steel guitar. Lana Turner turned heads in the movie! mwe3: Another track here, Love Letters In The Sand is another overlooked standard. How did you arrange the strings sounds to match the guitars? Is that where your harmony training comes into play? Whos playing the harmonica? Amazing how much is going on with that track! Fred Coots wrote that? Where did you find that song? Kay Das: I remember Love Letters being popularized by Pat Boone, the years might have been around 1957, just when Elvis Presley was hitting the charts, and listening to it on short wave radio from (then) Radio Ceylon and from Radio Australia. I was amused by Pat Boones whistling interlude. I did the whistling part playing a Hofner Toots Thielman chromatic harmonica. The backing was by Dutch Shadows guitarist Pete Korving. mwe3: Track 17 features your cover of Stingray, the Shadows classic from 1962. I had completely forgotten Claus Ogerman wrote that song! Its just amazing. Whats great is that you always list the composers of the songs your cover on your albums. Ogerman was mainly a jazz arranger right? He must have had the Shadows bug! I particularly loved his concert with Diana Krall, some wonderful instrumental breaks. It is the kind of jazz that appeals to me most. I have no knowledge of how Hank Marvin chose to play Stingray. I guess there must have been an EMI connection. mwe3: Same goes for Blue Star, which was a track on the very first Shadows studio album from 1961. Tell us something else about Victor Young? How did the Shadows find these amazing songs to cover and it makes sense for you to cover that song as the lead lines are so long and winding. From the TV show The Medic? Wow, was that a US or UK show? Kay Das: "Blue Star" became popular in many parts of the world from Indonesia to Brazil. An orchestrally rich version typical of the stylings of its time with piano and voices was featured in the theme music of the television series The Medic, an American production. In Indonesia this song was reproduced in the krontjong style and recorded by Rudi Wairata on steel guitar with his Amboina Serenaders. An instrumental version was recorded by The Shadows in 1961, but somehow never made it to the top rankings, and The Ventures too did one. I do not know much about composer Victor Young except that he hailed from Chicago and that he has composed a number of hits for Bing Crosby. mwe3: Plus, who knew Leiber & Stoller wrote Lucky Lips? Another track that became so huge thanks to the unique chemistry of Cliff and The Shadows. But I dont remember where the track came from or who did it first? Its amazing to think about the songs that came out of the Brill Building! Now theres a concept for a future Kay Das compilation! Kay Das: Leiber and Stoller's initial successes were as the writers of such crossover hits as "Hound Dog" and "Kansas City, in all over 70 chartbusters. They wrote hits for Elvis Presley including "Love Me" and "Loving You" which I have recorded on a previous CD, The Plumeria Journey and a host of others like "Don't", and "Jailhouse Rock. The Brill Building became a center of activity for the popular music industry during World War II, and many music publishers and songwriters had offices there. Once songs had been published, the publishers sent song pluggers from there to the popular white bands and radio stations. I particularly love the music of those times... yes maybe a future labor of love. mwe3: Closing the CD, Travellin Light is yet another instrumental cover of Cliff and The Shadows that works so well as a steel flavored guitar instrumental. Now you have to tell us who Sid Tepper and Roy Bennett were. Its just amazing how, thanks to you crediting these historic songwriters your albums are like musical encyclopedias! Kay Das: I think it was Travellin Light that got me hooked forever to the sound of the Shadows, just loved those Hank Marvin guitar fills. He must have been just in his late teens then. Sid Tepper and his musical collaborator Roy Bennett (no relation to Brian Bennett of The Shads) made their first hit in 1948, "Red Roses For A Blue Lady". They are credited with over 300 songs for Tony Bennett, Rosemary Clooney, Peggy Lee, Frank Sinatra, Sarah Vaughan, Dean Martin, and many more, including over forty songs for Elvis Presley in addition to those written for him by Jerry Leiber and Mike Stoller we referred to a little while ago. Tepper and Bennett also wrote Cliff Richards major hit "The Young Ones". Sid Tepper died in April last year, aged 96.
mwe3: What are your plans for the rest of 2015 into 2016?